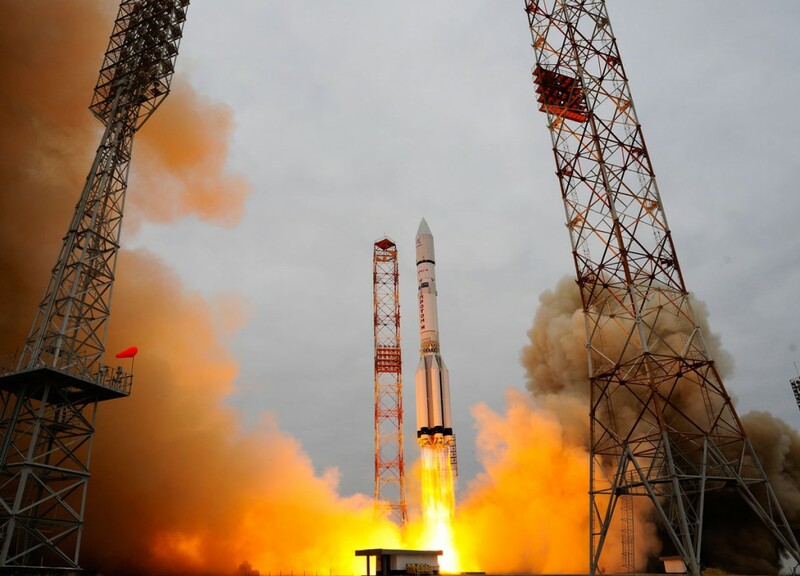 ExoMars 2016 lifted off on a Proton-M rocket from Baikonur, Kazakhstan at 09:31 GMT on 14 March 2016. The mission also aims to map Mars in high-resolution and search for hydrogen embedded in the Martian crust, a data point that suggests the presence of water at or just below the surface. A piggyback lander accompanies the orbiter on the trip, heading for an experimental descent into the Martian atmosphere in October. The landing probe is named for 19th century Italian astronomer Giovanni Schiaparelli, who made telescopic observations of Mars and triggered a wave of interest in Earth’s neighboring planet after he thought he found water-filled channels crisscrossing the rust-colored world. It turns out Schiaparelli was wrong, but his pioneering work in planetary science led future astronomers into the field. The successful launch Wednesday is the first phase of an ambitious multibillion-dollar Mars exploration program led by the European Space Agency. Named ExoMars, the program is a partnership between Europe and Russia, which agreed to provide rocket rides in 2016 and 2018 for back-to-back launches to Mars. The mission took off at 0931:42 GMT from the Baikonur Cosmodrome in Kazakhstan, vaulting into low clouds in less than 30 seconds on the power of more than 2 million pounds of thrust from the Proton rocket’s six RD-276 first stage engines. Ten minutes later, the 58-metre (191-foot-tall) Proton booster had accelerated to more than 4,000 kilometres per hour (215,000 mph). A Breeze M rocket stage launched atop the Proton rocket took over control of the mission, firing four times over more than 10 hours to reach higher orbits and eventually escape Earth’s gravitational tug. The ExoMars Trace Gas Orbiter and the Schiaparelli lander deployed from the Breeze M upper stage at 2012 GMT. Less than 90 minutes later, engineers at the European Space Operations Center in Darmstadt, Germany, received the first signals from the newly-launched spacecraft. 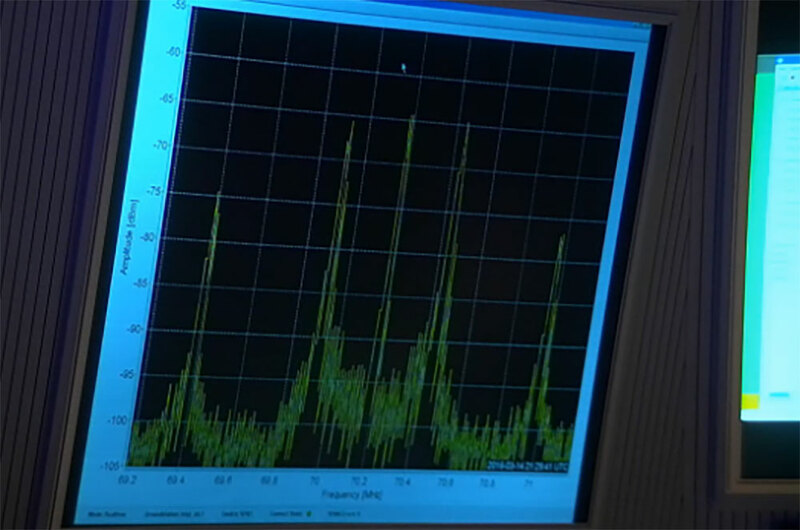 The first signals from the ExoMars Trace Gas Orbiter are received at the European Space Operations Center in Darmstadt, Germany. Credit: ESA. The orbiter and lander composite combine to make the spacecraft launched Wednesday one of the biggest ever sent to Mars, weighing in at approximately 4,332 kg (9,550 lbs) and measuring about the size of a moving van. Soon after the ground team established contact with the ExoMars Trace Gas Orbiter, ESA confirmed the spacecraft extended its power-generating solar panels, another key milestone in the critical early hours of the mission. A high-gain communications antenna was also to deploy shortly after ExoMars’ separation from the launcher, allowing the orbiter to communicate with Earth during the 500 million-kilometre (310 million-mile) voyage to Mars. Arrival at Mars is scheduled for 19 October. Three days before getting to the red planet, the Trace Gas Orbiter and the Schiaparelli lander will part ways. The orbiter will fire its main engine for a make-or-break maneuver to be captured by Martian gravity into a looping, highly elliptical path around the red planet ranging in altitude from 300 kilometres (186 miles) to nearly 96,000 kilometres (60,000 miles). On the same day, Schiparelli will hit the upper atmosphere of Mars at 21,000 kilometres per hour (13,000 mph) for a six-minute descent aided by a heat shield, a new European-made supersonic parachute, and braking rockets. Schiaparelli will touch down in Meridiani Planum, a broad, relatively flat region currently being explored by NASA’s Opportunity rover. Unlike Opportunity, Schiaparelli will have a brief life on Mars, and designers expect it to drain its batteries within a week. The lander’s primary objective is demonstrating technology to be applied to a European rover due for launch in 2018 or 2020. Artist’s impression of the ExoMars 2016 Trace Gas Orbiter and Schiaparelli lander arriving at Mars. Image: ESA. The ExoMars orbiter will dip into the upper fringes of the atmosphere of Mars for a series of “aerobraking” campaigns, using air drag to move the spacecraft into a circular orbit about 400 kilometres (250 miles) above the planet tilted at an angle of 74 degrees to the equator. The orbiter’s five-year mission will begin in late 2017, once the spacecraft arrives at its operational altitude to survey the planet with a high-resolution stereo mapping camera and analyze the gases making up the Martian atmosphere. 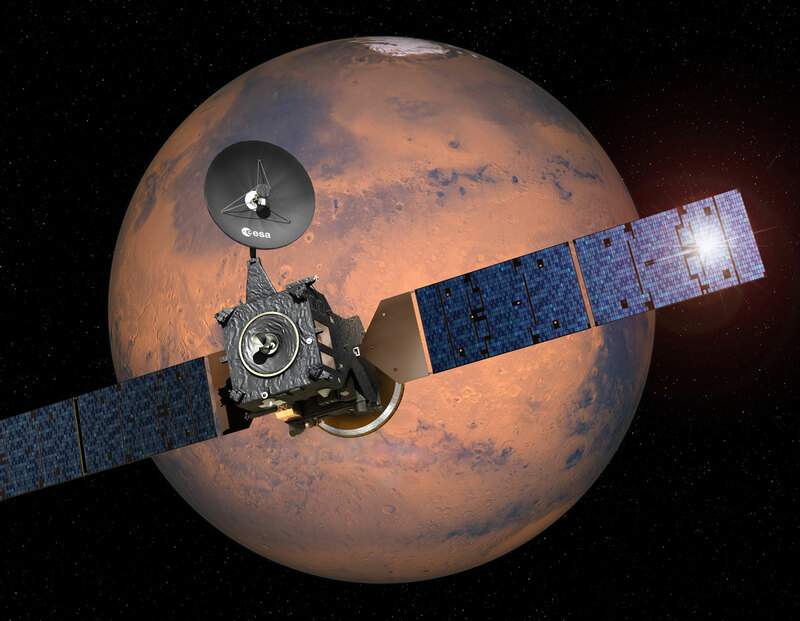 The ExoMars spacecraft’s orbit also makes it available to act as a communications relay for landers, such as Europe’s future rover, NASA’s Curiosity and Opportunity vehicles, and the U.S.-led Mars 2020 rover mission. The methane question has puzzled scientists for more than a decade, since Europe’s Mars Express mission found traces of the gas in the Martian atmosphere in 2004, a surprise discovery that immediately led researchers to ask if Mars was still biologically or geologically active. The methane signal later disappeared, but not before ground-based observatories detected the gas. The Curiosity rover also sensed a brief spike in methane in the air at its landing site. “The exciting part of the mission will be the landing,” said Jorge Vago, ESA’s ExoMars project scientist. “The scientific component of the mission will require patience. We are trying to, first of all, confirm the methane detection of Mars Express, and also the detection from Earth. Curiosity has also seen methane, so we have three points. “First of all, it’s to confirm the methane on Mars,” Vago said in an interview on the eve of the launch. Secondly, [we] try to understand how much of it there is, and thirdly, what is the latitudinal or seasonal variation. The mission dispatched Monday is Europe’s second Mars project, coming after more than a decade of development mired by financial, political and technical troubles. “It was a highly emotional moment,” said Roberto Battiston, president of the Italian Space Agency, moments after witnessing the launch from Baikonur. Italy is the ExoMars program’s largest funder, and the country led the design and fabrication of the Schiaparelli lander at Thales Alenia Space’s facility in Turin, Italy. The next chapter will include the European rover and a Russian landing platform launching together on another Proton booster as soon as May 2018. But officials caution the mission faces possible delay until 2020, the next time Earth and Mars are properly aligned for a direct trip. ESA originally planned to partner with NASA on the ExoMars program, with the U.S. space agency supplying Atlas 5 rockets for the 2016 and 2018 launches and a descent package to deliver the European rover to the Martian surface. NASA also considered building is own rover to go to Mars with the European robot, allowing the two vehicles to explore in tandem. But NASA largely withdrew from the ExoMars program in 2012 after cuts to the agency’s planetary science budget left no funding available to pay for the U.S. contributions, except for UHF radios to communicate with rovers on the Martian surface and sensor equipment for the ExoMars rover. ESA’s budget ceiling on the ExoMars program is 1.2 billion euros, or about US$1.3 billion at current exchange rates. That is not enough to cover the costs of the two rockets required by the missions, so European space officials sought Russia as a partner to launch the spacecraft in 2016 and 2018, giving Russian scientists access to build instruments to fly to Mars on the orbiter and lander. 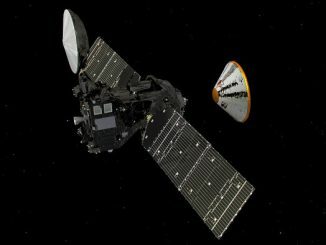 A saucer-shaped entry, descent and landing demonstrator separated from Europe’s ExoMars orbiter Sunday, beginning a three-day approach aiming to become the first European-built craft to set down on the red planet and return data. 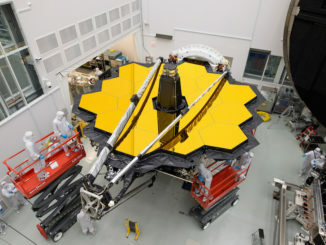 Extra testing of the James Webb Space Telescope and delays in assembling the powerful observatory will push back the $10 billion mission’s launch by at least six months to early 2019, officials announced last week as the telescope successfully completed an extensive performance test inside a cryogenic vacuum chamber in Houston. 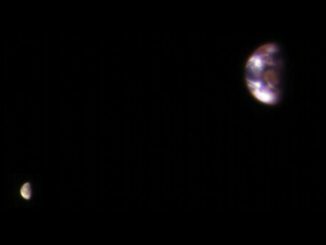 From the most powerful telescope orbiting Mars comes a new view of Earth and its moon, showing continent-size detail on the planet and the relative size of the Moon.